Place carts and bins within 3 feet of the curb, before 6 a.m. on your collection day. Please arrange carts and bins with at least 1 foot between them so the trucks´ hydraulic arm fits between each cart. To avoid damage, do not place carts within 3 feet of mailboxes, cars, telephone poles, trees, etc. Please don't overfill carts, lids must close and materials should fall freely when emptied. Over weight and over filled carts may incur additional fees. We encourage you to set out your recycling cart and glass bin only when full, or manageable. This makes collection more efficient and controls costs. Please note the labels on each cart specifying the items to be placed inside, i.e. do not use the recycling carts or yard debris carts for garbage. If the wrong material is found in the wrong cart, additional fees will apply. Carts and bin are the property of Sunset Garbage. Customers are responsible for damage costs, so please don't paint, cut, melt or otherwise damage them. Remove carts and baskets from curb/roadside after pick up. Don't block access to carts/bins or turnaround areas on your collection day. Our trucks are as big as fire trucks and need room to maneuver safely. Private roads, long driveways and locations with difficult access, may incur additional fees or receive limited service. 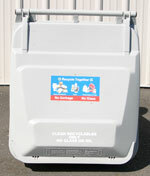 We provide a 95 gallon Gray Cart for recycling collection. 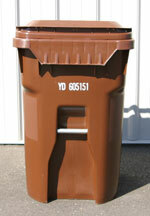 We provide a 65 gallon Brown Cart for weekly yard debris collection. 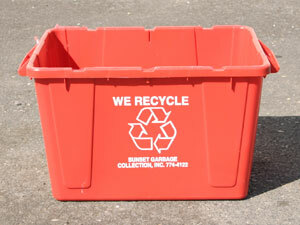 We provide a 14 gallon Red Bin for glass recycling collection. (recycle metal lids with metals, discard plastic lids, no bags). Motor Oil: Recycle in an unbreakable, see-through container (such as a milk or water jug) no larger than 2 gallons with a screw top lid. To recycle items not acceptable at the curbside, call Metro Recycling Information at 503-234-3000. Click here for Holiday Information. Click here for Bad Weather Information. 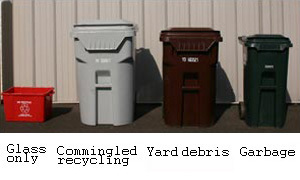 Clackamas Garbage and Recycling Brochure: Click here to view a printable brochure. Clackamas Garbage and Recycling Brochure (Spanish): Click here to view a printable brochure in Spanish. Holiday collection - if your collection day falls on Christmas or New Year's Day, you will be collected the following day, this pushes all collections one day late ending with Friday customers being collected on Saturday. No other holidays affect your collection schedule. Collection service for large unwanted items - we can pick up appliances, tires, furniture and other large discards for an additional fee. 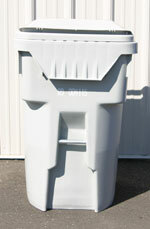 Also, we have 2, 3 & 4 yard containers and larger drop boxes available for clean up projects. Call our office for details, click here for drop box and container sizes and information. 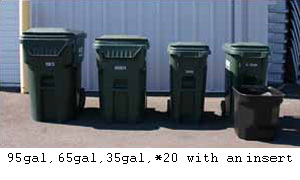 Household hazardous waste - please do not put hazardous or medical waste in your carts or bin. For safe disposal options or alternatives to hazardous products, call 503 -557-6363. To request an approved container for medical waste or collection of a medical waste container, call our office. Vacation and Temporary Stops - For vacations of (2) consecutive weeks or more and a maximum of (3) times per calendar year, please call our office in advance to receive proper credit. For autopay information click here. For online bill pay click here. Please call us at least 1 business day in advance of your collection day for any changes or stops in service. We will need to remove all carts in order to close your account.